In each episode between now and the end of the year, I’m determined to help you make progress, one day at a time. Today, we’re taking a look at what isn’t working for you right now. When we evaluate, without drama or judgement, what’s not working and what’s holding you back, we step into a tremendous amount of power. What doesn’t work is not cause for frustration, loss of enthusiasm or giving up! We get too frustrated too fast. We stop trying too quickly. That’s why I keep an Edison bulb in my work-space. It reminds me to KEEP the enthusiasm. It reminds me to keep trying. It reminds me to never give up. Thomas Edison and his team tried THOUSANDS of filaments before they go their lightbulb to work. Each one that DIDN’T work wasn’t some big dramatic failure. It was PROGRESS. 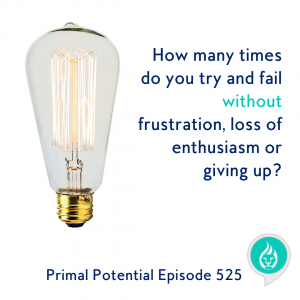 Today’s episode of the Primal Potential podcast is all about learning from what doesn’t work INSTEAD OF getting frustrated and dramatic about it! Use it to move you forward! From there, we’re going to establish new options. What else could you do? What could you adjust, just for today? We aren’t trying to change everything at all once, but what we’re looking to identify today are the destructive choices that happen either most often or have the most significant impact on your life. If you’re ready to make small changes that will create a big impact, don’t miss today’s episode! Looking to try Palmini? Here’s what I buy.